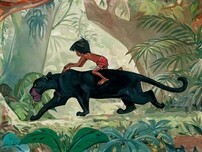 The Jungle Book is a 1967 animated feature film, released on October 18th. 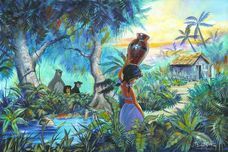 The 19th animated feature in the Disney animated features canon, it was the last animated feature produced by Walt Disney, who died during its production. 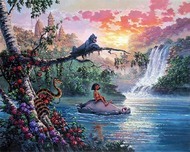 It was based, rather loosely, on the stories about the feral child Mowgli from the book The Jungle Book by Rudyard Kipling. 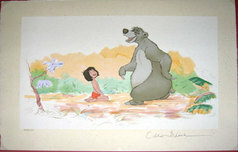 The movie remains one of Disney's most popular, and contained a number of classic songs, including "Bare Necessities" and "I Wan'na Be Like You". Most of the songs are by Richard M. Sherman and Robert B. Sherman. 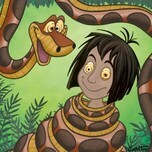 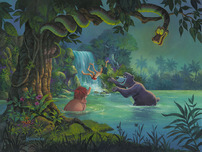 The film was directed by Wolfgang Reitherman, and Mowgli was voiced by his son, Bruce Reitherman.